It all started way back in 2005 and my very first UEFA Champions League Final in Istanbul at the Ataturk Stadium. And what a final it was to remember! Liverpool beating AC Milan of Italy at the penalty shoot-out after the 90 minutes produced six goals in a 3-3 thriller! I still remember my gear at that time - my Canon 1D did most of the work in Istanbul. I vividly recall Steve Gerrard lifting the coveted silverware with such force and excitement in the pool aftermath celebrations. 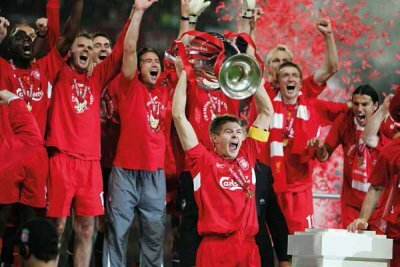 It was during these euphoric moments that I captured my flagship image of Gerrard lifting the trophy, which was later used a number of times in UEFA media sources. Photographic gear has come a long way since then. Then it was the Canon 1D Mark II and later on the 1D Mark IIN, the 1D Mark III and IV, and the 1D x, all of which did their job with great competence in this long, lovable and amazing journey of 11 UEFA Champions League Finals taking me from Istanbul to Paris, Athens, Moscow, Rome, Madrid, London, Munich, Lisbon, Berlin and of course Milan in May of this year and still counting!!! !